One thing you'll learn here is never to underestimate a woman’s touch when it comes to glamping. Twisting and turning along the winding country lanes, surrounded by undulating green and yellow fields deep in the heart of the Welsh/English borders countryside, it's almost impossible not to get childishly giddy about what treats await you at Cosy Under Canvas. As you slowly roll into the car park, offload your bags into the wheelbarrow kindly provided for you, and walk along the wooden pathway across a wild flower wetland, it quickly becomes apparent that when it comes to glamping, you can never underestimate a woman's touch. 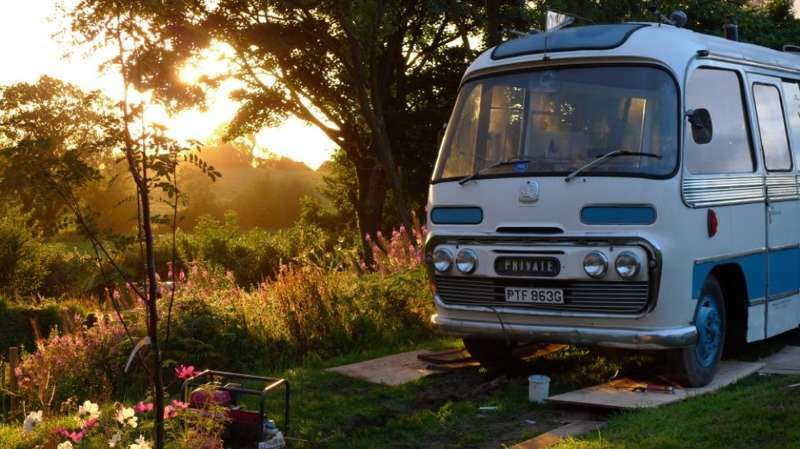 Owner Emma has been running Cosy Under Canvas for ten years now, and her experience and attention to detail resonates throughout the site – from the little welcome boards with your names written in chalk, to the homemade cakes left out for your arrival. There are seven pitches, spread out in a small private woodland and cleverly hidden from each other by the trees, and they consist of five spacious geodesic dome tents – Holly, Oak, Beech, Hazel and Rowan – and two cosy domes – Willow and Ash. All come with their own wood-fired hot tub, firepit, chiminea, compost loo, indoor wood-burning stove, sheepskin rugs, super comfy double or king-sized beds, raised double futons, wood and kindling, lanterns and tea lights. There's a 'cosy corner' which is filled with board games and activities for kids, a 'cosy lounge' with comfy chairs, beanbags and low tables for chilling out, and a large communal sheltered kitchen – with full recycling facilities – equipped with everything you could possibly need for cooking up a storm over a campfire. There's also fresh drinking water and a handful of gas stoves in case the rain puts a dampener on things. The two communal showers are heated by the large wood-fired Aga in the kitchen – a nice communal touch, as it relies on everyone chucking in a log from time to time to make sure the water stays hot – but if you fancy a proper power shower (heated by a biomass boiler) then pop up to the main house. With all these green credentials, it's no wonder that Cosy Under Canvas is also the proud owner of a much coveted gold Green Tourism Award. 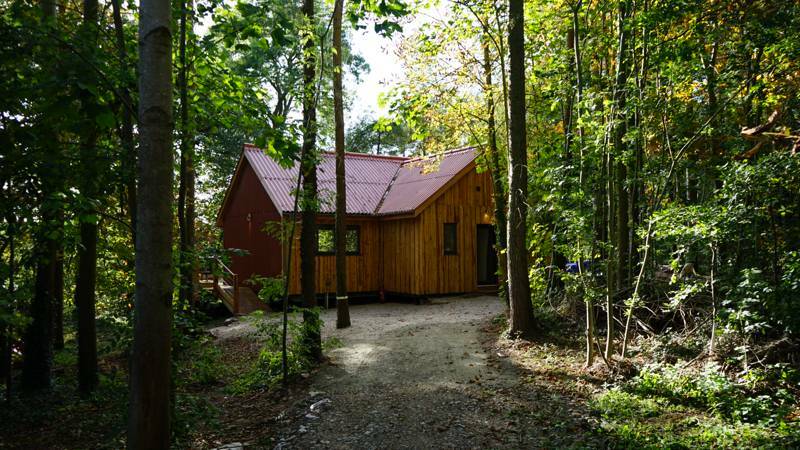 All in all it's a woodland retreat like no other. The kids will never want to get out of the hot tub, and couples will only want to cosy up with each other next to the fire and stare up at the starry dark skies above them. 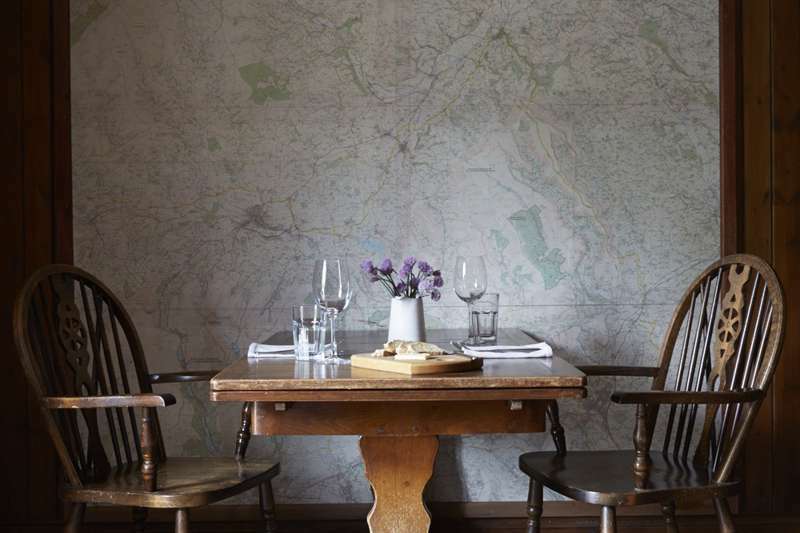 You're also close to the literary haven of Hay-on-Wye, with plenty of organic food shops, antique and secondhand stalls, and bric-a-brac gems to keep you occupied for a full day. Hay is also situated within the 520 square miles uninterrupted and truly outstanding natural beauty of the Brecon Beacons National Park. 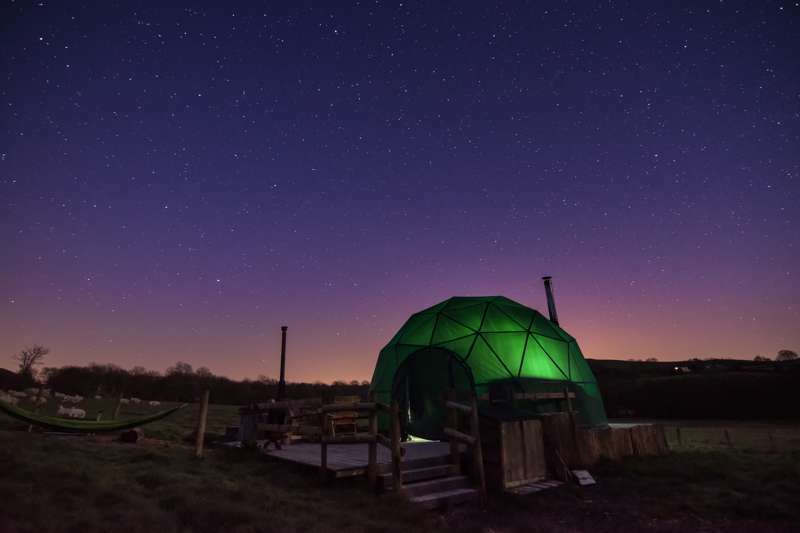 Rustic and luxurious, award winning Glamping in a Welsh woodland.Whether you're after sanctuary or adventure our Dome holidays are great for loved-up couples, family down-time or group gatherings. Satisfy your craving for the outdoors with no compromise on comfort. Think comfy beds, snug duvets, fluffy sheepskins and cosy rugs. We’re off-grid and eco-friendly with compost loos, wood-fired showers and solar lights – but stylish geodesic domes, personal toiletries, real coffee, private fire pits and steamy hot tubs mean you don't have to rough it. Just enjoy the relaxing surroundings, beautiful scenery, and interesting things to do. Our favourite spot has to be Oak Dome Hot Tub. It's tucked away behind the dome and has stunning views over the surrounding fields. Perfect for a night of steamy relaxation under the stars or a date with the dawn chorus! We love living close to Hay on Wye, it's such a friendly and interesting market town. Famous for its second-hand bookshops and now with a wealth of vintage and independent shops, it's easy to while away a few hours in town. The Brecon Beacons National Park is also on our doorstep. It's a Dark Sky Reserve so star -spotting is a regular pastime here. The opportunities for walking and hiking are endless and if you're feeling a more adventurous canoe down the Wye, take to the hills on horse back or book in with an activity company and give gorge-walking, climbing, archery or quad biking a go. You can be as chilled or as active as you like and let us know if you need any help or advice. Lunch at The Old Electric is a must. Browse the ever-changing offerings of interesting furniture, lighting and eclectic items, along with a wonderful fresh, modern, vegetarian cafe, gallery, studio spaces and partners who share areas within the shop. Stylish and spacious, our geodesic domes are the perfect balance of camping and comfort. There are just seven, evenly spaced around the woods and cleverly hidden from each other by the trees. 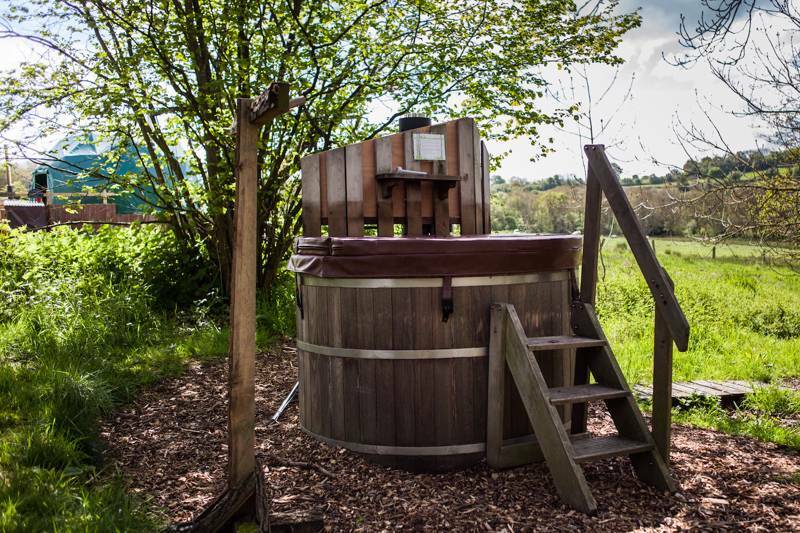 And now with wood-fired hot tubs, we've really thought of everything to get you back to nature in style. 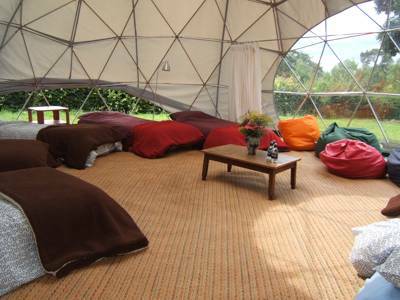 Five Spacious Domes each big enough for 4 adults or a family of 5 – 6, and two Cosy Domes large enough for 4 adults. Domes from £130 - £796 depending on the season / weekend / mid-week / full week. Check out the directions before you leave home as there is no mobile signal from about a mile away from the site. SatNav should take you right to the place, but if you're coming from Hereford, follow the A438 towards Brecon for 13 miles, staying on it until you enter Wales. In the village of Clyro you'll see a brown 'Cosy Under Canvas Glamping' sign. Turn right, then right again, and Cosy Under Canvas is on the right after 4 miles.